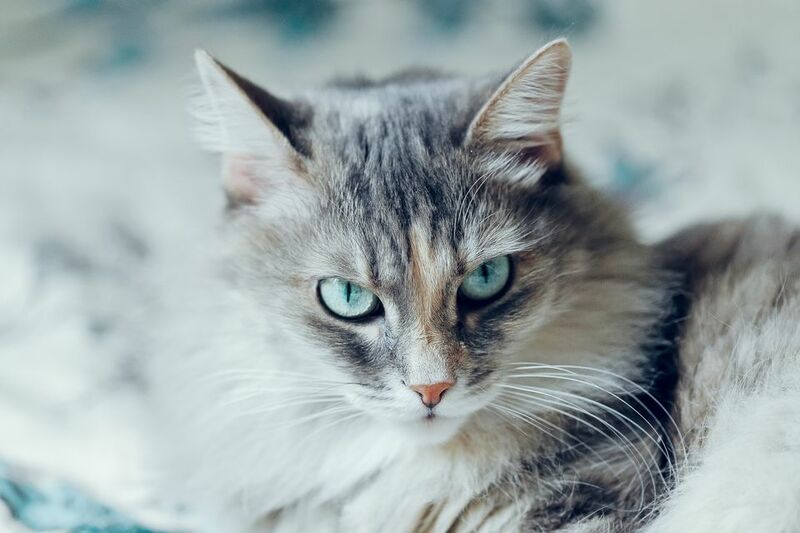 If you are looking for a medium-sized, semi-longhaired cat that is both breathtaking to behold and an affectionate pet, look no further than the Siberian Cat. The Siberian Cat is a forest cat native to snowy Russia, where it needed its luxurious triple coat to protect against cold. The breed’s solid, well-muscled, body with substantial boning developed hold up to the harsh environment. The Siberian Cat’s trademark sweet expression comes from its modified wedge head with rounded contours, moderately short muzzle with slight curvature, and medium to large, almost round eyes, which come in shades of green, gold, green-gold or copper (white cats may have blue eyes or “odd eyes”—eyes that are two different colors). This Siberian Cat has a delightful personality—outgoing, affectionate, friendly and energetic—making it an exceptional feline companion. They love the companionship of people and will greet you at the door and follow you all over the house. Although Siberian Cats are relatively quiet cats, they do like to vocalize via sweet and melodic mews, trills and chirps. They enjoy the company of other cats and even dogs, and are good with gentle, respectful children. Siberian Cats hail from Russia, where they are cherished as a national treasure. It’s hard to say just how long Siberian Cats have existed in Russia, but based on Russian fairy tales and children’s books, they have likely been around for hundreds of years and maybe as long as 1,000 years. Siberian Cats were described in a book called Our Cats and All About Them by Harrison Weir, which was originally published in 1889. The United States got their first glimpse of the Siberian Cat after the Cold War thawed in the 1990s, and it was love at first sight. The Siberian Cat is recognized by the Cat Fanciers’ Association and The International Cat Association. The Siberian Cat’s luxurious, thick, full coat may come in any color or pattern, with or without white markings. The triple coat is made up of three layers: a shorter, dense undercoat of downy hair (the hair closest to the skin); a layer of slightly longer “awn hair” in the middle, and an even longer outercoat layer (called “guard hair”). In warm weather, the Siberian Cat will shed the heavy coat in favor of a shorter, thinner summer coat. In winter, the coat will be at its thickest and longest. Despite its thickness and length, the Siberian Cat’s coat tends to resist matting, so only requires occasional brushing (more during the seasonal heavy shed). Occasional baths will help loose hair come out and remove dust and dander from the coat. Trim the nails regularly and inspect the ears for dirt and debris. Wipe the ears out with a cotton ball and gentle ear cleanser (never stick a cotton swab or anything else down into the ear canal). If the ears look red or excessively dirty, schedule a checkup with your veterinarian. The Siberian Cat is intelligent and exceptionally playful. The breed is known to be slow to mature, taking as long as five years to graduate from kitten-like antics. This means the Siberian Cat is a lot of fun to have around! They love to climb, explore and play. To keep your Siberian Cat mentally stimulated and physically enriched, expose it to a variety of fun toys and play lots of games. With its thick, long coat, you might find it odd to think that some people consider the Siberian Cat hypoallergenic. Although no scientific studies prove it, some allergy sufferers say that they can live successfully with a Siberian Cat. As it turns out, cat dander—not necessarily cat hair itself—is the main culprit for allergies. Most cat-allergic people are sensitive to a protein called Fel d 1, which is found in cats’ skin cells (as well as dried remnants of saliva and urine that coat the cat’s fur). It seems that some cat breeds, including Siberian Cats, produce less dander than other cats. For mild allergy sufferers, this might mean that Siberian Cats elicit little or no allergic reaction. However, all cats and all people are different. If you suffer from allergies and are interested in finding out if you will react to a Siberian Cat, find a local breeder who will allow you to come to her home and sit with her adult cats to test the theory. Most reputable cat breeders keep Siberian kittens with their mom and siblings until they are 12 to 16 weeks old, after which time they are ready to go home with their new families. The Siberian Cat is a generally healthy breed, but a known genetically linked disorder occurs in some Siberians. Hypertrophic cardiomyopathy (HCM) is a form of heart disease that causes thickening of the heart muscle. Responsible breeders screen their cats for HCM to avoid breeding cats affected by the disease and passing it along to future generations. Otherwise, check out all of our other cat breed articles to help you find the perfect cat for you and your family.